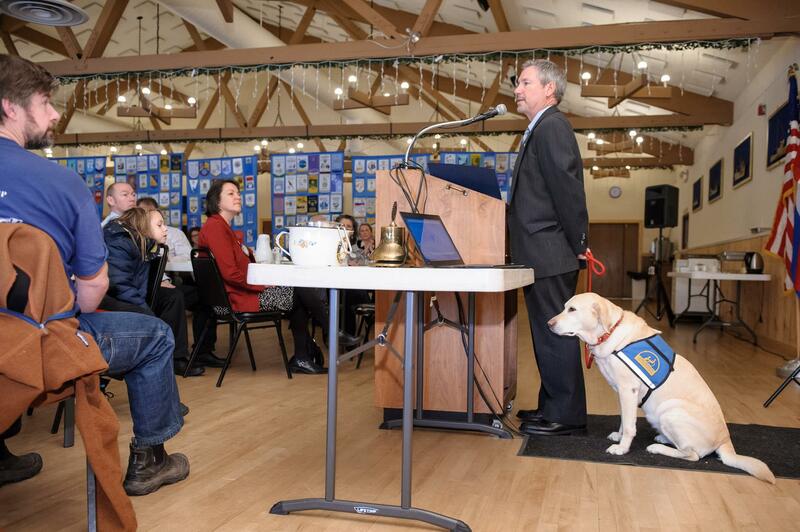 Kitsap County Deputy Prosecuting Attorney Kevin Kelly introduced us to Kerris (Welsh for “love”), the courtroom therapy dog. He explained that Kerris is a specially (and rigorously) trained dog trained to provide a calming effect to witnesses in a courtroom setting. He is used in the Kitsap County Drug Court and basically sits quietly by the witnesses who would like him nearby to calm their nerves. Kevin explained that both adults and child witnesses seem to be comforted by his presence, as they offer testimony on often traumatic experiences. He mentioned that some children being interviewed only responded when Kerris was present. Kerris can sit calmly in the courtroom for hours at a time, but is ready to play like any other dog when he’s home with Kevin.